Take TX 71 west and go south on Hamilton Pool Road (FM 3238) for about 13 miles. About thirty minutes from Austin. Admissions per vehicle. W hen I think of the typical, old-fashioned swimming hole, Hamilton Pool immediately comes to mind. Hamilton Pool formed when a cave over an underground river collapsed thousands of years ago, creating a waterfall and swimming grotto. Hamilton Pool is an excellent example of the typical geology of the Balcones Canyonlands and the Edwards Plateau. The pool is on the convergence point of the Pedernales River and Hamilton Creek in southwest Travis County. There is evidence of Tonkawa Indians around the area, and it is a very old swimming hole. Land grants from the state and the H. Reimer family preserved the area. Hamilton Pool is named for Andrew Jackson Hamilton, a Texas State Representative, Attorney General, U.S Representative, tenth Governor of Texas and a noted anti-secessionist. Seventy five paved parking spaces are available at the ranger's station. From there it is a short hike down to the swimming hole. The trail travels under shady juniper and mesquite trees. Watch out for prickly pears! You may see armadillos, wren, squirrels and swallows along the way. A limestone outcropping frames the circular swimming hole. Hamilton Creek flows over the cliff and falls 60 feet into the pool. There is a large rock under the falls where the water splashes in a shower. The shoreline is made up of rocky limestone and extends across one side of the pool. There is minimal shade around the pool. The pool closes to swimmers occasionally when naturally occurring bacteria levels are too high. There is no drinking water; pets, glass, fires and cooking are prohibited, but the park does have rest rooms and picnic areas. Guided tours are available by reservation. Hamilton Pool is a collapsed grotto and canyon formed by thousands of years of water erosion. Tonkawa and Lipan Apache tribes were attracted to the lush vegetation, abundant wildlife, and natural shelter provided by the grotto. Cultural remains dating back 8,000 years have been found at Hamilton Pool. In the 1860s, Morgan C. Hamilton bought the property. His brother was Andrew Hamilton, 10th Governor of Texas (the pool is not named for Andrew, as noted in the first edition). In the 1880s, the Reimer family bought the property from Hamilton to raise sheep and cattle. The Reimers were German immigrants. Legend has it that their eight year-old son discovered the pool while exploring. The Reimers opened the pool to the public for recreation, although in those days only a handful of people had access to transportation to visit the park. 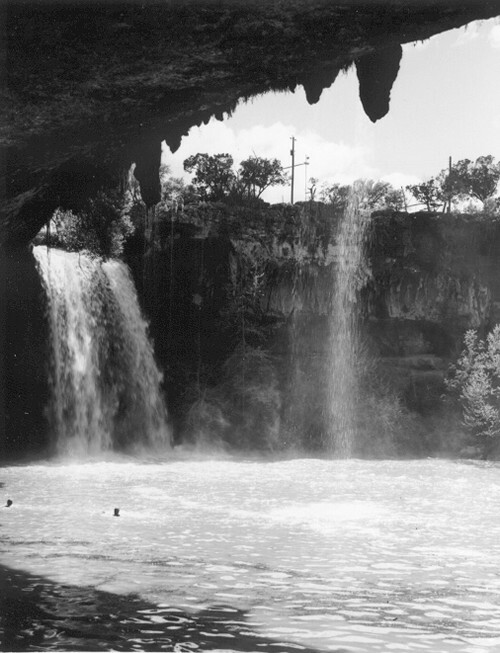 However, by the 1960s and through the 1980s, Hamilton Pool's popularity soared and the land began to suffer from the sheer number of people traveling through. Decades of grazing on the land had altered the ecosystem, and Hamilton Pool was in danger. In 1985, Travis County recognized this and bought 232 acres from the Reimers to implement a preservation plan that continues to this day. You can also hike about one mile from the pool to the Pedernales River. At FM 3238 and FM 962l, 15 miles west of TX 71 near the intersection with U.S. 281. The Westcave Preserve is a thirty-one-acre park with cypress, moss, ferns, orchids, travertine pools, a waterfall and a cave. There is no swimming allowed.